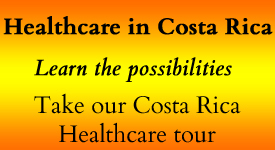 In January of 2014, we attended the monthly seminar offered by the Association of Residents of Costa Rica (ARCR). 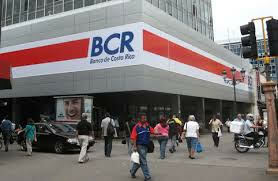 As members of ARCR, we learned that we qualified for ARCR assistance in opening an account at Banco Nacional (BN) for a fee of $20. After hearing about so many problems experienced by other expats, I was glad to pay for this convenience. A letter from my credit union saying I was a good customer. An electrical bill from ARCR to use for our address. I know, weird. Money – I gave them $100 to open two accounts (colon and dollar) and $10 for a token to online access (more below). The ARCR employee led us to the BN branch next to their office in Sabana Park. She accompanied us to customer service and presented all the paperwork above and we opened an account in 30 minutes. We came back the next day to pick up our debit cards ($10) and token. We learned there is no real thing as joint accounts. My wife can sign a check; withdraw money, etc., as my beneficiary, not as a joint account holder. Where that comes into play is if I die first. ARCR told us if anything happened to me, that my wife was not to tell the bank since they will immediately freeze the account until they receive all the official paperwork on the death, which could take a long time. In the meantime, my wife would be without funds. ARCR suggested my wife first go withdraw all the money from the account BEFORE updating the bank on my passing. I opened the account using my passport. Why that is important: you need to present the ID you opened the account with when dealing with the bank (in person). That means you must carry your passport with you every time you go to the bank. Personally, I like to leave my passport safe at home if I can. Once you get your cedula (residency card), it is better to switch the bank ID from the passport to the cedula to avoid future problems. Some of those problems include not being able to access your account AT THE BANK if you ever get a new passport. 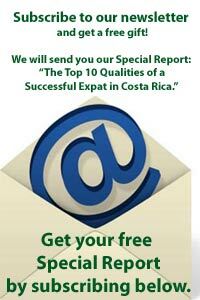 (You get a new passport number when yours is stolen or renewed.) Note: you can still do online banking and use the ATM without showing an ID. 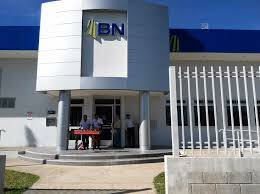 We opened two accounts at BN – colon and dollar. I am not sure why, but everyone else before us did, so we did too. I think the reason is that money wired from the US needs to go from a dollar account to a dollar account. Otherwise, you can move money back and forth and pay bills from either account. BN does the currency conversion when moving money between your colon and dollar accounts, but I am not sure how favorable the exchange rate is. 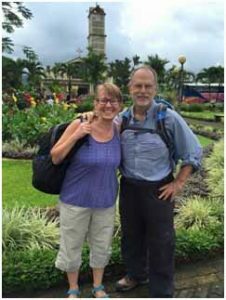 We left Costa Rica after the seminar and opening the bank account and did not return for ten months when our residency was approved. When I returned, I learned my accounts were frozen due to inactivity. I went to the bank and reactivated them with no problem. There are two main national banks – Banco Nacional (BN) and Banco de Costa Rica (BCR) – plus many private banks like ScotiaBank, Davivienda, etc. There is much consternation and discussion in the gringo community on which bank to use since each bank has advantages and disadvantages. 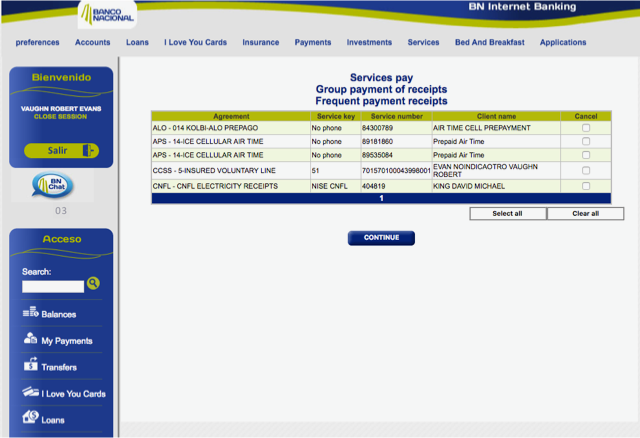 Since ARCR was offering to open the account at BN, that was good enough for me and I have not thought much about it since BN does everything I need. 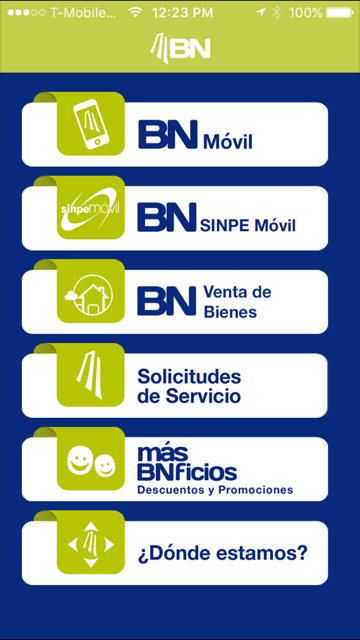 First, the BN website is in Spanish. Scary? It shouldn’t be. Google Chrome browser translates the pages, so I have not had much trouble and most people could navigate the site in Spanish since banking is universal. Here is where it gets strange. 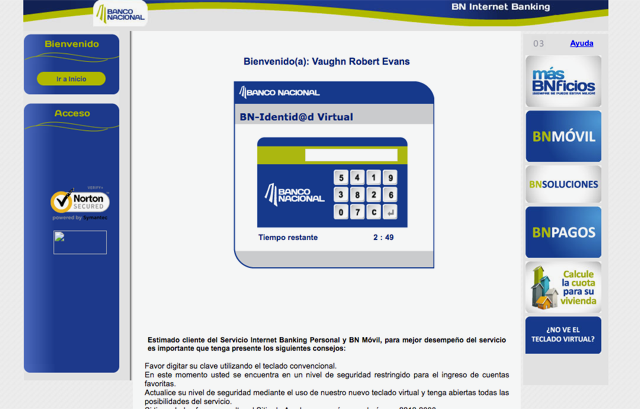 BN pops up a screen to enter your password, which has to be a special series of letters and numbers. The password screen requires you to type in the letters on the COMPUTER keyboard and the numbers by selecting them from the KEYPAD. I have never encountered that security feature before. BN makes me change my password every 90 days, so I put it on my calendar to be ready. Another interesting security feature is the “token.” After entering your ID and password, BN will require you enter numbers displayed on a token. You get the numbers to enter above from a little device called a token, which you buy when you open your account. 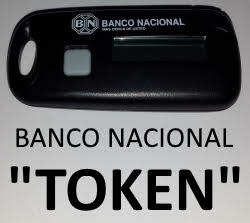 The token has millions of numbers in it that correspond to numbers associated with your account. 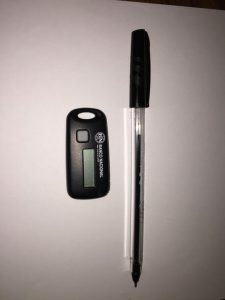 The “token” device serial number is entered into your profile at the bank when you open your account and the numbers from the token matched to the numbers of your account to verify your identity when signing in. These security features, while a little troublesome, should make you feel your account is secure. The token, shown below, is small enough to connect to your key chain. Pressing the grey button pulls up one of the millions of numbers that are associated with your account. So after the password and token are entered, we finally get to the banking screen. You can see Google has translated the page to English and the actions like checking your balance are on the left and along the top. On the screen below, I selected “My Payments” which brings up a screen with bills I frequently pay online – phones, CAJA, and electric bill. When you first start, you follow the prompts to enter whom to pay and are given the opportunity afterward to make the payment a Favorite so it will come up automatically under My Payments next time. For bills like the electric bill, BN computer queries CNFL and displays how much I owe. Sadly, there is no automatic payment option for “set and forget.” On the other hand, I have to enter the amount myself when I recharge my phone. For all you 24/7/365 people, it is not unusual to not be able to pay a bill on the weekend when they take CAJA or electric company computers down for a siesta. The workaround is to try again mañana. I also use the BN mobile app. Unfortunately, language translation is not available on the phone app like on the web, but surprisingly you may not need it once you have used the web interface. The good part is the phone app does not need the token to authenticate, so I can leave the token at home when we travel and still pay bills from my phone. 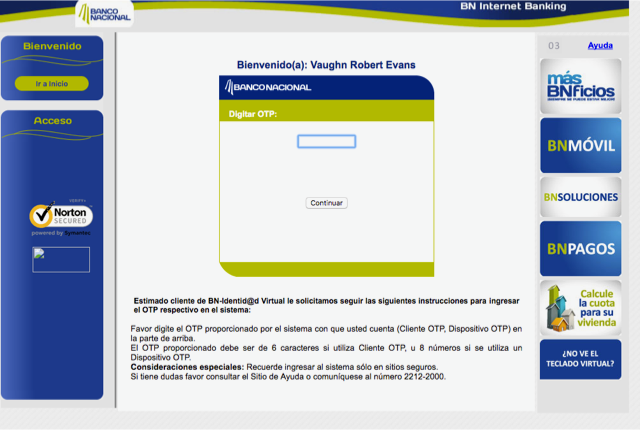 Finally, having my account at Banco Nacional makes renewing my residency easier. 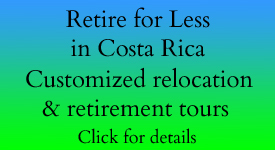 When you renew your residency, you need to provide proof you are bringing money into Costa Rica. My residency approval requires I deposit $1,000 a month. So every month, I write a check for $1000 against my credit union in the US. The funds typically are withdrawn in 3 days, but they stay frozen at BN for 20 days. When the time for residency renewal rolls around, I go to the BN customer service and have them print my monthly statements showing the required $1000 deposit and they stamp each page to make it look official. I take those 12 statements to the interview and breeze right through. I know many gringos go through agony trying to open a bank account in Costa Rica but it does not need to be hard when you deal with ARCR and Banco Nacional.